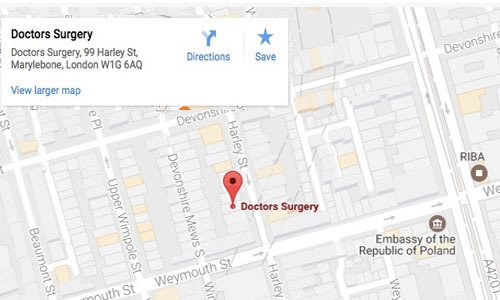 We are located in Harley Street. The nearest Tube stations are Regent’s Park, Baker Street and Oxford Circus. There is on-street meter parking or an off-street car park at the southern end of Harley Street. Our phone line is staffed during normal office hours – Outside of this there is an automated answering system – If you need Emergency Treatment outside of normal office hours please listen to the information provided via our automated answering service. As part of our enhanced service for our members, early morning and evening appointments can be arranged. Enquire about our membership programme for many extra health benefits. Our map is fully interactive. Click on the image above and you will be taken to our full map, then just use the controls displayed to enhance the level of detail. To move the map, simply slide your mouse over the map and hold the mouse button down while scrolling.